The demand for pink wines has quickly gone from a wave to a surge to a flood at this stage and, no, it isn’t your imagination that there are far more of them than ever available, from all over the world. In terms of sheer numbers the amount of Rosé imported into the United States from France’s Provence region, the winegrowing area most people associate with quality pink wine (90% of the region’s total wine production is pink), has been increasing exponentially since 2013, a watershed year for the category. Two thousand-thirteen saw a remarkable 41% jump in imports over 2012, sales to the U.S. rose another 29% by volume and an impressive 38% by value in 2014 but 2015 completely blew the doors off the market as imports soared by 54% in volume and an astonishing 60% by value. Since 2010 Provence Rosé imports to the U.S. have gone from 123,000 cases a year to 1,300,000 in 2016. I don’t have access to the specific number for value growth for 2016 but the volume increase was off the charts, again, at 47% over 2015. In terms of French Rosé consumption in the States, wines from Provence now make up almost 43% of all French Rosé imports by volume and 54% by value, which is market dominance if I’ve ever seen it. Needless to say, every other wine region in the world has been paying close attention to this ongoing pink wine tsunami and adapting their own marketing to take advantage of wine lovers’ seemingly insatiable thirst for all things Rosé. Spanish and Italian versions, in particular, have enjoyed steadily increasing demand in recent years, as have those from regions consumers might not naturally associate with Rosé wines, such as Germany and Austria. A number of high-end American wineries, especially in California and to some extent in Oregon, have set their sights on making premium Rosé, often with impressive success. Unfortunately most of them are seldom produced in any significant quantity, making them difficult to find without a dedicated search. Increased demand for any wine always opens the doors for those that would otherwise likely be passed over by most importers in normal market conditions. That is especially true for Rosé. While I have already tasted more Rosés than ever before, this year I’ve also tasted a greater percentage of good but not great bottles as well, as my scores indicate. Wines of all types that are poorly made have become increasingly hard to find these days but there are still plenty of adequate but not truly exciting bottlings out there. I think that this is even more the case for Rosés as a consequence of overheated demand, which puts some producers’ focus more on cranking out the juice while putting less of a premium on high quality. To Drink or to Hold? 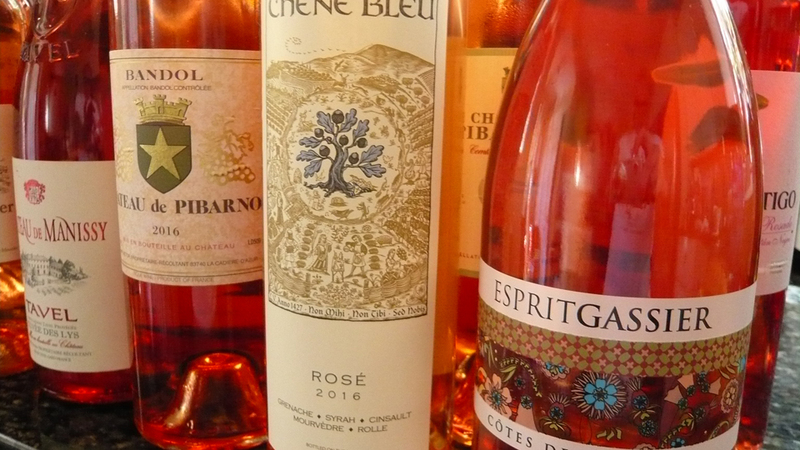 A commonly discussed point on the Rosé topic is whether or not the wine need to be drunk up as soon after release as possible or, at the very least, before the next vintage arrives. For the wines reviewed here I absolutely wouldn’t feel a pressing need to drain this year’s supply by fall, as some might. That’s especially true for most of the high-end bottlings from top producers in regions such as Bandol and Sancerre. Considering the fact that many of these wines are made with extreme care, from well-tended vineyards and also that they are, at this point, barely six months old, it’s no stretch to say that with rare exception they’ll be showing even better this autumn than this summer. Non-believers should stash at least a couple of bottles aside for a year or so to see for themselves. I tasted these wines in New York this spring, along with many others that will be included in part 2 of this year's pink wine coverage.